The Killara House, designed with Studio [R] Architecture & Design, has recently been photographed by Tom Ferguson. The images are now available for viewing in our SELECTED PROJECTS section. The project involved a renovation and extension of an existing functionalist-style house, and the addition of a new low-slung living pavilion on this magnificent double block backing onto a pocket park. The landscape architecture was designed by Amber Road, with construction carried out by Ferrocon. Our Rodd Point project is nearly complete, with landscaping works being finalised in time for Christmas. The project included a complete renovation of an existing bungalow and a major extension at the rear. The approval process included a simultaneous Development Application and Complying Development Certificate. More photographs of the project will be available early next year. Our recent competition entry in collaboration with Woolacotts Consulting Engineers has received a High Commendation at the Engineers Australia prize-giving ceremony on Friday August 1st in Canberra. The design, titled 'Kinetic Canopy Lookout', proposed a glass-floored viewing platform which would be raised and lowered using the power of water. For the full story see link to Woolacotts news item here. The competition panels can be seen in the Selected Projects section. Our Party Wall House project has recently been published in the Daily Telegraph's Home magazine, with words by Robyn Willis and photos by Katherine Lu. To view a PDF of the article click here. We have started work on a new project in Bondi. The scope includes a new swimming pool, landscape scheme and a garage/studio pavilion accessed from the rear laneway. The existing large terrace house, situated in a conservation area, will also be refurbished and extended. We are very excited to see the Killara House project nearing completion, with the client moved in and landscape going in this week. The project was designed with Sam Rigoli and Studio [R] Architecture and Design, with landscape architecture by Amber Road Design. The existing house was refurbished with a new living pavilion added at the rear. The construction was carried out by Ferrocon. We are working on a new alterations and additions project in Sylvania, which aims to transform a simple single-storey residence by adding a new living space with high ceilings connecting to a loft-style first floor rumpus room. A new circular stair provides access to the first floor addition, adding detail and an industrial aesthetic to the house. Construction has started on the alterations and additions project in Vaucluse. The scope involves refurbishing the existing house, adding a new lift to improve circulation, and new garaging for the client's car collection. The house enjoys expansive views towards the Harbour Bridge and city skyline. Our new house project in Russell Lea is nearly ready to start construction. The house includes a partially subterranean lower ground level, which houses a three-car garage, wine cellar, and media room. The ground floor volume contains the bedrooms and open-plan living, dining and kitchen spaces. An internal courtyard provides natural light in the centre of the plan. The roof is a set of skillion planes with highlight windows facing east to provide indirect natural light. We are currently finalising the details for the project and expecting completion in mid-2015. Mark Szczerbicki's presentation on the use of models in the design process is now available on eclassroom.com.au as a Continuing Professional Education lecture. 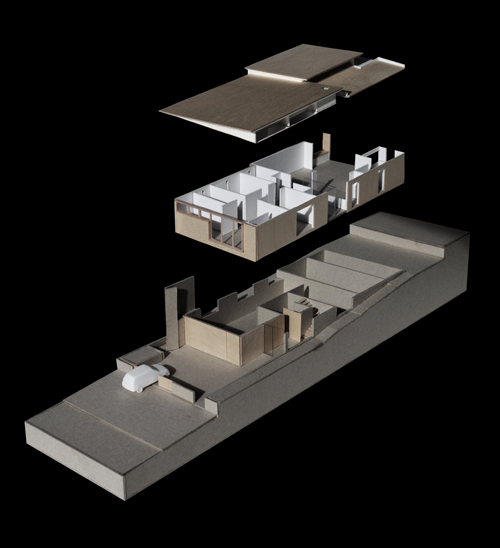 The presentation explores the many ways in which current European practices use physical models, and includes insights into many well-known offices such as Atelier Jean Nouvel in Paris and EMBT in Barcelona. We are in the design phase of a new project in Drummoyne - major modifications to an existing single storey brick house. The project includes a new split-level open plan living space, and new first floor bedroom level. The house has great views of a nearby park and will include a plunge pool in the back yard. The design of the new project at Huntleys Cove is progressing well. The house includes a lower ground bedroom level, a 'suspended' living space above, and a separate pool pavilion building. We have been developing the project mainly using physical study models like the one pictured. We are hoping to start construction later in the year.